As the year winds down to the solstice, dark days and long nights are upon us. What better time to bake a deep, dark, dense, chocolaty cake? 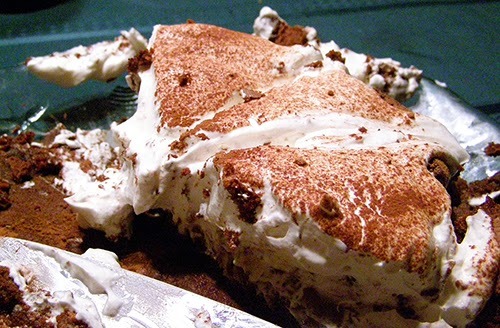 And to keep the light alive during this annual time of darkness, how about adding a thick layer of whipped cream on top? If only this cake had lasted longer at a recent potluck, I could have gotten better photographs of it. But the combination of dark chocolate and light cream is irresistible. The cake itself is lighter in texture than some flourless cakes; the eggs make it rise and stay moist inside, and form a thin chewy (and chocolaty) crust on top. It’s no wonder that Richard Sax features this cake on the cover of his Classic Home Desserts: A Treasury of Heirloom and Contemporary Recipes, the best-ever dessert cookbook. Unlike other flourless cakes, this one is foolproof. The tricky part of such cakes is folding the heavy chocolate/egg yolk mixture into the light egg white mixture. The tendency is to over-mix, because the substances are so dissimilar that it takes a lot of effort to blend them. This recipe adds two whole eggs to the chocolate and yolks, which makes the two parts more similar and easier to mix together. Two tips to make this cake even more delicious: use the highest quality chocolate that you can find, and allow the eggs to come to room temperature before starting the recipe. If you have a dessert-loving baker on your Christmas list, I highly recommend Classic Home Desserts, the only dessert cookbook s/he’ll ever need. Richard Sax collected and tested many popular recipes, then chose the absolute best. You’ll find pies, cakes, tarts, puddings, fruity creations, and more. Each recipe is presented in an easy-to-read format, with clear step-by-step instructions. In this book you’ll find only one recipe for flourless chocolate cake, lime pie, and persimmon pudding, etc. : just the very best! Happy holidays to you, fair reader! Rest ye merry! Preheat oven to 350 degrees F. Line bottom of an 8-inch springform pan with a round of waxed paper. Do not butter the pan. Stir and melt chocolate in double boiler, or in a bowl set over hot water. Remove from heat and whisk in butter until melted. Set aside. Separate 4 of the eggs; leave 2 eggs whole. Whisk together whole eggs to egg yolks until well blended. Whisk in ½ cup granulated sugar until just blended. 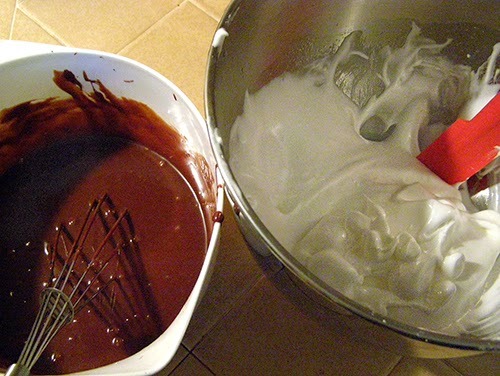 Whisk in the warm chocolate mixture. Whisk in cognac or Gran Marnier and orange zest. In another bowl, with an electric mixer, beat the 4 egg whites until foamy. Gradually adding the remaining ½ cup granulated sugar, beat egg whites on high, scraping bowl down periodically, until they form soft mounds that hold their shape but are not quite stiff. 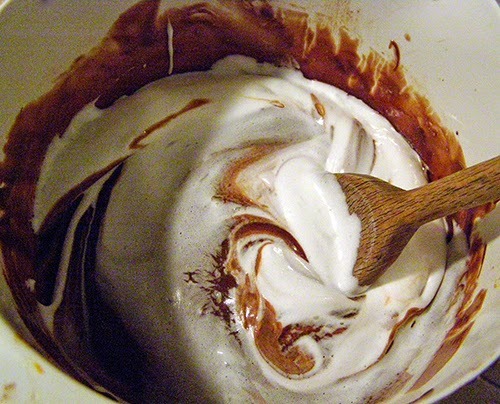 Gently stir about ¼ of the egg white mixture into the chocolate mixture to lighten it. Gently fold in the remaining egg white mixture until almost uniform in color; don’t over-mix. Pour batter into springform pan. Smooth the top carefully; an uneven top will rise unevenly. Bake at 350 degrees F. until top of cake is puffed and cracked and center is no longer wobbly, usually about 35 – 40 minutes (check at 30 minutes if your oven runs hot). Do not overbake. Cool cake completely in pan on wire rack. Do not unmold. 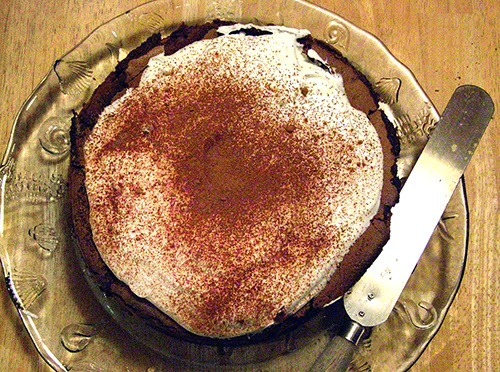 Cake will sink as it cools, forming a crater with high sides. Chill a bowl and beaters to whip the cream. At serving time, whip the cream with the powdered sugar and vanilla until not quite stiff. 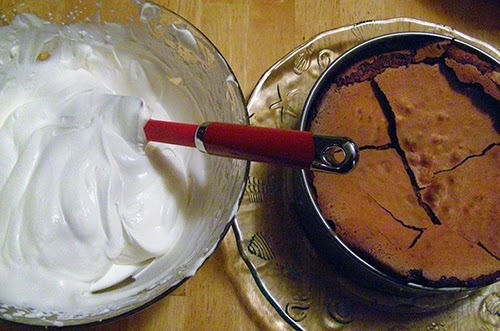 With a spatula, carefully fill the crater of the cake with whipped cream, pushing it gently to the edges. Dust the top lightly with cocoa powder and garnish with chocolate curls if desired. Place cake, still in springform pan, on platter. Run the tip of a knife around the edges of the cake. Gently remove the sides of the pan and serve.